Be careful with this step, and note if there’s a sticker attaching the hd cable to the hd. I failed to recognize this and tore the cable apart! Peel off or slice the sticker first. To remount the SSD drive I used a gaffa tape (that stuff musicians are using to fix cables), did cut a piece of some centimeters and folded it, so that a open piece with the glue can be sticked onto harddrive. Gaffa tapes usually are around 4 to 5 cm wide so it is easy to maneuver the SSD with the two screws easily into the holes in front of the case. After things are in place and before remounting antenna I removed that tape from the harddrive. The hard drive tape cover is there to protect the hard drive's exposed circuit board (remember this, the picture doesn't show it). You probably do not need it if your hard drive is totally shielded in a box, as many SSD devices are. That said, it's VERY easy to remove and replace the tape using the spudger (keeps your finger oil off the glue). Everything worked like a charm, though i didn't have the logic board removal tool. Instead i used 2 small screwdrivers. Disk was replaced by an SSD. Thanks. Is this cover necessary? I don’t have any tape to tape it back on. Is this cover necessary? I don’t have any tape. What is that black hard drive cover made of? I’d like to get one for my HDD that I’m using in my Fusion set up. Does ifixit sell it? To remount the drive, I’ve used the suction tool from the Pro Tech Toolkit. Similar experience here - everything was easy peasy but dropping the new drive back in was tricky because I couldn't get leverage to lift up the left side. With both the antenna plate and the fan still attached, it was hard to hold the mini vertically to let the new drive drop in. I just unplugged the fan and set it aside instead, held the Mini vertical and then wiggled in the new drive. It lined up pretty easily and I was able to reattach the connector and then plug the fan back in and proceed to reassembly. The antenna plate slid back in the same way it came out and I applied minimal pressure to get the last screw hole to align and it snapped into place perfectly. Whole project took about 30 minutes - including having several colleagues come by my desk to chit chat and distract me. Thanks! I can also confirm that the drive can be replaced at step 12, WITHOUT disconnecting the antenna. the hardest part was getting the new drive in correctly. I turned the unit right-side-up to get the drive to "fall" into place correctly. Great guide. Thanks! Upgraded stock 350GB with a 1TB and restoring from Time Machine as I type this. After that, restored OS, all settings, file and apps from old drive. Two hours later, back up and running. Bravo, Apple! With a Windows machine you'll be there for days doing the same thing! In the comments to the MacMini mid 2011 guide there's an excellent tip in how get the SSD in place, by first attaching it loosely to the antenna plate and then use the antenna plate to manoeuver the SSD into position (the two screws on the thin side of the SSD must fit into two rubber sockets). Then carefully loosen the screws again leaving the SSD in place, and finally resposition the antenna plate. 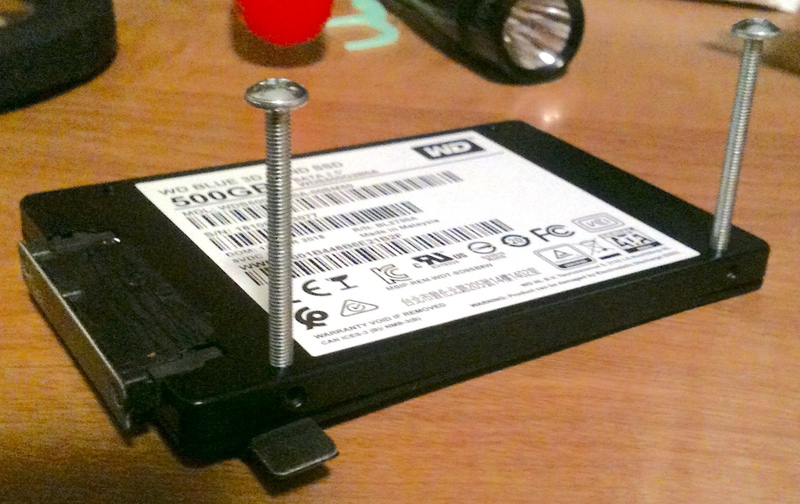 I also thought about using a plastic suction cap on the SSD to grip it, but I didn't have one. Removing the motherboard entirely isn't too difficult - just make sure that everything is disconnected (IR sensor, power supply line; I got away without disconnecting the wireless antenna, preferring to carefully maneuver it out of the case with the motherboard). Just be careful for a rubber covering around the power supply. Mine popped out when I removed the motherboard; it seems easy enough to replace, but when I closed up the motherboard for the first time, the rubber contorted and covered the power port. I had to remove the motherboard again in order to reposition the rubber. I just installed a Samsung SSD in a brand new MacMini Corei7. Surprise! It had the HDD in the lower (actually the upper) bay. And then you have to completely remove the logic board to get to the two screws on the side of the HDD. Just follow the steps for 'installing a second harddisk'. Interesting detail: the two holes in the logic board where you have to put the 'logic board removal tool' are aligned with two plastic rings glued to the aluminum frame, so you actually use the tool as a lever to edge out the logic board. One question remains: is the SATA cable for the lower position identical to that of the upper position? Check replacement drive dimensions - My original drive was a 7.0mm thick (Hitachi 500G) drive. While I did get a 9.5mm replacement drive (SSD) to fit, the shortness of the disk drive cable (mentioned in step 18) made it an awkward fit. I'd recommend 7.0mm thick drives in the future. Thanks for this useful step-by-step. - Opening the bottom cover works much better if you apply the force on the whole surface with the palm of your hand, and then rotating, instead of just using your thumbs. - You don't have to remove the fan connector, just put the fan aside during the whole operation. I would advise against messing with these very fragile connectors, unless you know exactly what you're doing. - You definitely don't need to remove the logic board, when you've achieved the first 12 steps you can skip to 17. - The two screws from the original hard drive are very important: you have to put them back in the same place on the new hard drive. Without them the new HD won't fit into the aluminium enclosure, there are two small holes designed for the screws. - Putting everything back in place was pretty straightforward, except for the antenna grid. The only way to do it was to twist the grid a little, since you only need a fraction of a millimeter to get the two screws to fit. - I was really hoping to be able to skip steps 13 to 16 like many user comments suggest, but I couldn't. My 9.5mm HDD wouldn't get past the DIMM slots. I was trying to lift it up while sliding it out and there was 1mm or so of thickness that wouldn't pass, so I had to remove the logic board. However once I had inserted the new disc I realised I had forgotten to put back 2 screws from step 19. Without those the disk is loose, not really holding in place, so I didn't have to remove the logic board again. What is weird is I also managed to put it back with the screws, just by tilting the mac a little. So now I don't really know if I could have actually managed to pull it out at step 12.. I successfully completed this for a Mac Mini Late 2012 purchased at the end of Feb 2014, replacing the stock 500gb snail drive with a 500gb Samsung 840 Series SSD. No logic board removal was required, and the antenna could remain attached - there was actually a plastic cover over the antenna connector, meaning removal and replacement would've been a pain anyway. This replacement was a breeze, and even though I took my time and was every careful, it was only a 20 minute job. The only thing that caused me pause was the removal of the tape holding the old drive's protective sheet onto the SATA connector... Trying to do that without tearing and creasing was not fun, though my iFixit spudger helped. I just want to add that I think it's criminal that this very capable little Mac is still sold with the antiquated likes of a 5400rpm drive. My intention on the outset of purchase was to upgrade to an SSD, but I was shocked at how slow the stock drive made the Mac run, with countless slowdowns and lockups. Overall, a great guide. replacing the HDD was more difficult than i expected as the holes are hard to line up on the back surface. Turning the computer bottom side down helped. This also allowed better fitment of the antenna surface. Its worth noting that not all HDDs have a screw hole located on the left hand side, so mine is secured by only one screw. I took the opportunity to pull the heatsink and replace the paste with Arctic Silver paste. So far my temp gauge (palm of my hand:)) says its running cooler. I skipped steps 14-16 and was fine. I did disconnect the antennae grill, but it was likely not necessary. Great guide. Like some say it is probably not necessary to remove WiFi antenna, but it makes it easier (mine popped off anyway). One person says no need to slide out the logic board, there is no way the drive would have come out of mine without sliding out the logic board. It's easy so just do it. Unfortunately for me the new drive I was installing is about 1mm wider so won't fit in the correct way, but it fit at an angle. It is difficult to get the drive back in, but I found if you hold the Mac right side up and slide the drive in that it will slide right in to the holes. This was invaluable. And - sometime the disk come out after step 12. I had the Mac Mini late 2012 hardware, but the original disk I was replacing was mounted on the lower frame - therefore the logic board and power supply DID have to be removed to get to the drive and replace. Other World Computing had the same mistake - they insisted the hard drive would just fall out without removing logic board and power supply and that was not the case. This is a complete set of instructs, thanks much for the work - I used two small screwdrivers in place of the logic board removal tool and that worked just fine. Closest instruct video at OWC is the late 2012 Mac Mini Server video. Confirmed and worked perfectly. At step 12, the HDD comes out with no effort and no need to unplug the antenna. I replaced the HDD with an SSD. The Mac mini flies now! Boot time : 20 sec (as opposed to 59 sec with the HDD). Word starts up in 1 sec! I cloned the HDD to the SSD using SuperDuper! and a SATA-USB adapter. Don't forget to activate the TRIM afterwards. I can also confirm that you can remove the hard drive after Step 12. For me, it was a bit hard, as my SSD was 9.5mm and was on the upper bay. With a little bit of force, I did successfully get it out. In the process, for me at least, I ripped off the black paper casing entirely, and the sticker covering the SATA connector, but everything survived. That antenna plate is a royal pain in the you know what, but replacing the hard drive with an SSD otherwise went nice and smooth. Clear concise instruction. I can also confirm removing the logic board and the antenna plate are unnecessary. For the antenna, just carefully move it aside. Excellent, excellent description of steps needed. I used the process to successfully replace a HDD with an SSD. I agree that the antenna plate could have been set aside, however it was easy enough to remove and reattach. I did order a complete toolset prior to attempting this process, which made it that efficient. Thanks for the excellent write up - worked great in my experience! When replacing the HDD with a SSD, is there any temperature concerns with sensors like the older core2 mini's? If I just swap these out will the system fan peg? Very easy fix with the detailed instructions. My HD came out after step 12 as well and no need to disconnect the antena cable either. Connecting the new SSD was very easy and reattaching the antena plate was too putting the screws that secure the SSD to the plate with the plastic prier before setting it to it's place completely. nothing about a fusion drive. The bottom drive was simple to remove. The top drive, the spinning drive, I haven't a clue!!! The first SSD upgrade I did, did not require me to pull the logic board. The second did however. I guess its just the luck of the draw. One comment about that, the screw that comes from the yellow highlight hole is actually removed when you take out the fan assembly. I've done a couple of these so far (out of a dozen) and have failed totally to get the vertical screws to secure the SSD to the antenna plate. Are there any videos anywhere? The Seagate 15mm high 2.5" ST5000LM000 fits perfectly with a Samsung 850 EVO SSD and a dual drive kit from OWC in my Mac Mini. You have to exclude the mounting screws in the plastic frame, and remove the logic board, power supply and plastic frame to fit the disk in first. The HDD must go towards the top of the case and the SSD towards the base, and the cables will only fit if the SSD is going to end up on the first SATA port (/dev/sda in Linux), but it works perfectly, temperatures have been stable and the disk + SSD work well with ZFS. This was great and it was much easier than it looked. The only issue I ran into was this. I had purchased a refurbished Mac Mini and since this guide was written they have changed how the hard drive is held in place. The two silver screws on the top of the antenna cage are just decorative now. You have to unplug a cable from the logic board, it's just one very simple plug, no tools. You then slide the logic board out completely and you will see two torx 9 screws holding the hard drive in place. The one on the right is a little bit hard to get up but otherwise it's dead simple. I did take photographs but I'm not sure how to pass them on beyond putting them on imgur and posting a link. Also if anybody's curious low-voltage memory seems to work fine, I bought 1.35v ripjaws SODIMMs, a total of 16 gigs. No issues. The 2TB firecuda is happy too. I have to replace the fusion drive in mine. My understanding is that there is an SSD AND a Spinner in there (two drives), and I have bought replacements for both. But this set of instructions doesn't seem to say anything about how to remove the second drive. I ignored steps 10 and 11. I performed step 12. Ignored steps 13 to 16. Step 17, put the mini mac upright that the existing hd can go down with a little help. Only dificult was when return to step 9 to 8. The holes was not paired. So I put the torx tool in the hole and do a little leverage and then.. Clip ! perfect! I also discovered I have the "fusion drive" version with the hd in the lower slot. Mac mini Late 2012 Power Supply Replacement helped me enormously. No need for logic board removal tool, just move it outward. What I didn't find out is if you could just pop in a second drive on top and leave the old one in there; is there another caddy required? 1) Les 2 vis torx de l'étape 19 trouve un centrage au fond du boitier. Cela assure l'isostatisme du HDD. Sans un bon position des 2 vis dans leur trou, le HDD est en mauvaise position et il ne sera pas facile de repositionner sa nappe sur la carte mère, ni de le fixer à l'antenne qd celle-ci sera remontée. 2) A noter que concernant la grille d'antenne, celle-ci doit prendre en sandwich le boitier. Forcer est inutile. Il faut juste bien prendre en sandwich le boitier et les 2 vis oranges de l'étape 8 se retrouve normalement en face de leur trou sans avoir à appuyer ou quoi que ce soit. I found out the hard way after wrong breaking the IR sensor from the logic board that there no need to got past point 12 to the the hard drive out. NO NEED to go past point 12 . from my point of view this guide is misleading. Cost me my logic board. You should update the instructions, to take out the steps involving moving the logic board. It adds an unnecessary complication to the instructions. the Mac Mini Logic Board Removal Tool is not needed, to replace the hard drive. In fact, when I got to the step that required the logic board removal tool, I was a bit dismayed, as I didn’t have one handy. But then, it occurred to see if I could remove the hard drive anyways, and found to my surprise, that I could. Guide should be re-written to omit steps 10 thru 16. I was able to replace my HDD with an SSD without disconnecting anything but the SATA socket or fan sink. The only time it should be necessary to remove the logic board is if you have the server edition or an aftermarket double drive riser. Should also note that outside of mirroring the drive itself, the swap took about 20 minutes start to finish. The hardest part for me was getting my ham hands to reconnect the fan socket. If the hard disk is at the ‘normal’ position and not in the upper position, you don’t need to remove the fan connector, wifi connector or IR/power light connector to get the disk out. Just replaced the mechanical drive with a SSD. This guide was a good reference, but found I didn’t need to do anything with the logic board. I did remove the fan, antenna plate, and cowling. I felt it was good for me to disconnect the antenna plate and fan to make it easier to get the drive to fit into the two holes inside of the case. The most difficult part of the reassemble was getting the antenna plate back in. The two side screw holes wouldn’t line up. I could get one, but not the other. I found there is a grove in the rounded part of the plate that needs to fit into the thin edge of the case opening for the plate. So, I used a small screwdriver that fit into the small holes of the plate, carefully lifted up the front rounded part of the plate, worked it around until the edge of the case slid into the plate. At that point all the screw holes of the plate lined up. Worked as a charm, keep the logic board on, you can stop once the antenna cover is gone. Might be wise to disconnect the antenna. Make sure you insert the disk with the Mini up side down for the pins to align in the holes. 10 minute job (and I am not an expert). Right. I have a 2012 Mini with a 1 TB fusion drive. Recently, the spinny drive just kicked the bucket. I’m going to have a go at trying to replace it, but am unsure what to replace it with, and whether I need to be concerned about its symbiotic relationship to the puny 256 MB SSD drive.Any recomendations on which drive(s) to buy, and if I should watch my during this adventure? Apple’s Fusion Drive is indeed a “symbiotic” fusion between the SSD and the HD. Unlike “hybrid” drives, where the most used files are kept on the SSD in their ENTIRETY for speedy access, the Fusion Drive only keeps the most used PARTS of files on the SSD. In short, your files are spread over both disks in a way you can’t control. So with the HD part of your Fusion Drive dead, you have to install new drive(s) and re-install your data from your backup. I did this and tried to re-install the Fusion Drive, which requires a special version of OS X, but failed several times and gave up in the end. Instead I configured my Mac Mini with a 500 GB SSD primary drive and a 1 TB HD as a secondary, but of course you could put two separate up to 4 TB SSDs in the two slots, depending on your needs and how much you want to spend. No doubt, putting all your system and application files on a SSD is the best and cheapest way to dramatically improve overall speed. Putting data on the SSD has less effect because most data aren’t that big or speed sensitive (photos and video excepted). Two separate internal disks are not a natural fit with OS X. There are no A:, B:, C: etc. drive designators like in Windows, so the secondary, internal drive appears more like an external USB drive, except it works at full SATA speed, of course. I have moved my music and all other user data except photos from my user folder to the secondary drive and use symbolic links to point to them, but if you use a large SSD as primary, that’s not necessary, and you may want to use the secondary drive in a different way. Or leave that slot empty to keep things simple if you don’t need the space. The 1.12 TB Fusion Drive was a way to get affordable SSD speed back in 2010-12. Nowadays, we can buy 500GB SSDs for less than £100 and 1TB ones for less than £200. BTW: It doesn’t matter if you put your primary drive in the upper or lower position; you can boot from either. Oh, and just FYI: the “lower” position is the one closest to the bottom of the computer. You sometimes see this called the “upper” position because it is on top when the computer is upside down, as it is when you take it apart. Oh, don’t forget to activate TRIM after installing an SSD. If you don’t, it will get slower and slower over time. The reason is that OS X’s file system does not tell the disk to release space freed up by erased files until it wants to re-write in that space. That works fine with hard disks, but it slows down SSDs. Thank you for this. I looked up the specs for the Crucial BX300 I installed, and sure enough it has TRIM support, so I enabled it. This was incredibly easy to do. It took me all of 10 mins. Like others have already said, you don’t have to do anything past step 12. FWIW, my antenna connector had a black plastic tab over it making it a tad tedious to remove/reinstall the antenna. Don’t bother with Apple’s ridiculous method of preparing a bootable USB drive in Terminal (why they STILL don’t give us an easier way to do it I’ll never know). Save yourself the frustration and use a utility such as Diskmaker X. Actually, looking back I didn’t even need to remove the antenna.. yet another unnecessary step in this guide. What is that black hard drive cover made of and does anyone know where I can get one? I don’t want to install a secondary HDD without it. The IR connector is SOLDERED to the board, don’t remove it as this article advises or it will just break off and IR won’t work until replaced. No need to pull logic board out either.